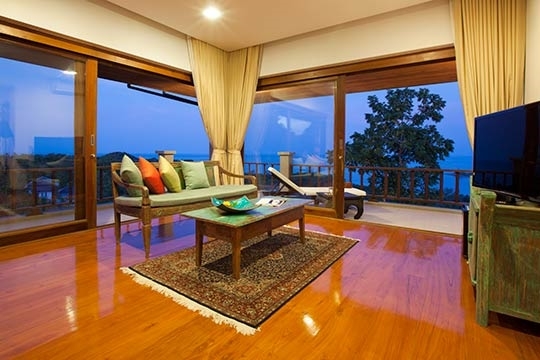 Hilltop View 2 offers spectacular views across Choeng Mon Bay. 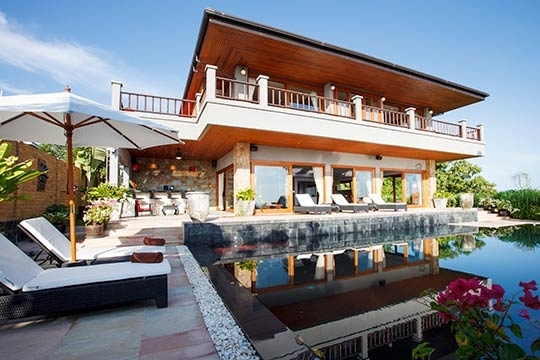 As part of the Samui Summit Estate, this 4-bedroom villa benefits from the use of a shared tennis court as well as 24-hour security. Enjoy elegant furnishings punctuated with antiques and artwork as well as a sociable pool and terrace. If it’s a view you’re after, you won’t be disappointed at Hilltop View 2. 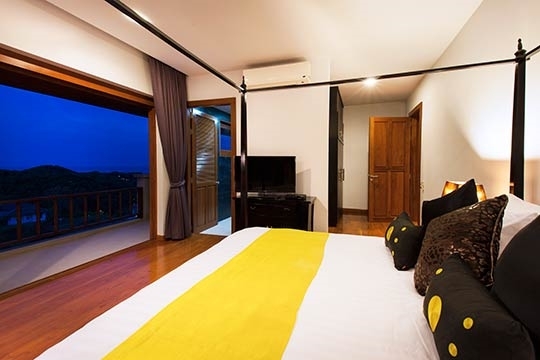 Two of the bedrooms as well as the large lounge and outdoor entertainment areas look out over Choeng Mon bay and the tiny island of Koh Som, as well as neighbouring Koh Phangan. From here, you can watch sailboats and local fishermen coming and going as well as a few jet-skis whizzing about below. If you’re keen to cool off from the tropical heat, take a dip – or even swim a few lengths – in the 64sqm black slate pool. Plenty of loungers are positioned to make the most of the view and top up that tan. But should you prefer shade, open up a parasol or move to the outdoor covered bar-lounge. This area is also perfect to enjoy sundowners – you get sunset views to the west, and, should you be an early riser, sunrises to the east. If you can tear yourself away from the villa’s charms, Choeng Mon beach is literally a few hundred metres away. The energetic can walk, but be warned that the last few metres of the return leg are steep! If you’ve hired a car for your stay, it may be best to use it (although for a reasonable extra charge the villa offers a transfer service not only to Choeng Mon, but elsewhere on the island too). 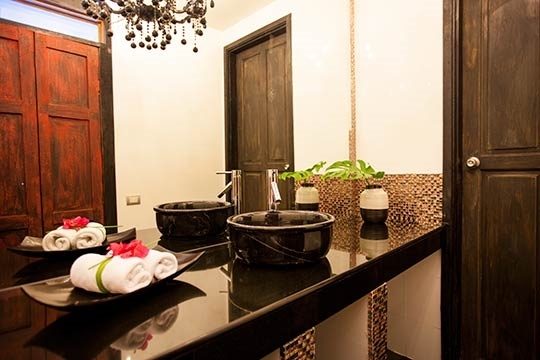 And if you don’t feel like heading into town for a massage, the Estate Manager, Khun Birth, can arrange for a masseuse to come to the villa. Massages and other treatments are all well priced, so worth taking advantage of. There are several excellent restaurants in nearby Choeng Mon village, and the beach itself is one of the best on the island. But for an intimate dining experience, book a private chef for either a poolside barbecue or Thai-inspired dinner from the suggestion menu (extra cost). Lazing by the pool, days easily extend into night as lights illuminate the garden, water features and wall murals, creating a relaxed mood. 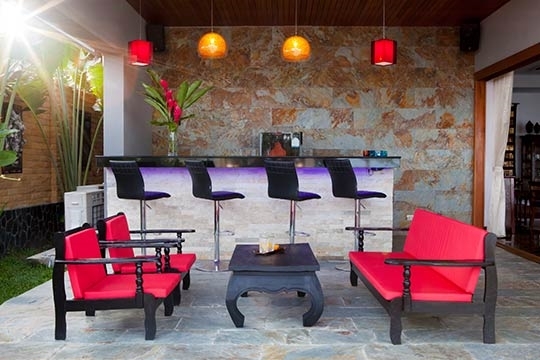 The pleasant outdoor covered bar area not only has a fridge (stock it to your liking) but also a sound system, making this area perfect for sociable tropical evenings. 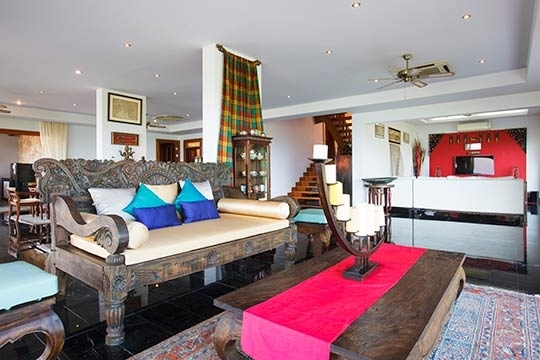 An elegant antique-filled villa with stunning sea views, close to the beach. We thoroughly appreciated the care and dedication that had clearly gone into furnishing and decorating Hilltop View 2. And the years that the owners spent amassing their treasure trove of antiques and collectables have certainly paid off. However, the house doesn’t feel like a museum – many of the pieces are usable items, although a few, such as the teapot collection, are carefully put away for eyes only. Although TV shouldn’t make or break a holiday, it was nice to be able to watch what we wanted from our bed, each room having its own satellite channels. Not that we managed to stay awake for long: the bed was so comfortable (with both down and foam pillows) that sleep came quickly. But be careful! The silent air-con and black out curtains meant that it was all too easy to miss the sunrise and that early morning beach run. We made the most of the tropical climate by drifting between the pool and jacuzzi for cooling down, reading in the shaded sala, and grabbing a drink from the outdoor bar in between. 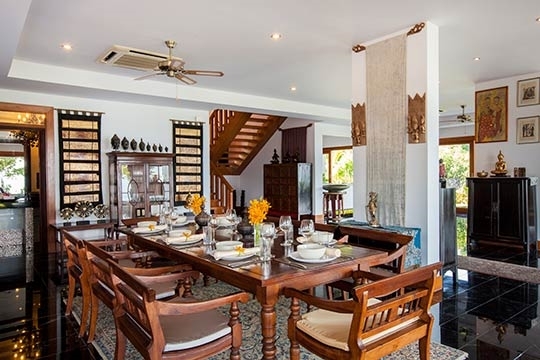 The housekeeper keeps the villa spotless and estate manager Khun Birth is happy to act as a concierge service and book any extras or activities you may require, such as a chef, massage, or transfer, and is knowledgeable on what to do in the area. We chose to open up the sliding doors to the pool and let in the sea breeze while enjoying our continental breakfast, later changing to air-con when the midday heat set in. The fully equipped compact kitchen offered a home-from-home feel and we enjoyed whipping up a few snacks after stocking up at the fresh food market. Making use of the private chef one night was however an indulgent luxury not to be missed. We loved being surrounded by the owners’ artwork and collectables, and the outdoor entertainment area with the covered bar, sala, pool and jacuzzi made for a very sociable and relaxed stay. As the villa is filled with collectables, those with young children may not feel totally at ease. 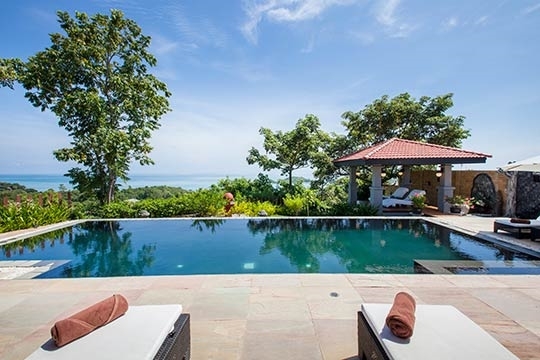 Hilltop View 2 lies at the top of the Samui Summit Estate, and offers some beautiful ocean views. Looking towards the sea, an open plot of land lies to the left, and another villa is currently (June 2013) being constructed to the right, however this didn’t disturb our stay. Hilltop View 2 is surrounded by a tropical garden, with tall trees that offer privacy and, rather than obstructing the view, form part of it. Although Choeng Mon village is only about 500m away, it’s a relatively steep hill, so you may prefer to hire a car or use the estate transfer service (extra charge applies). 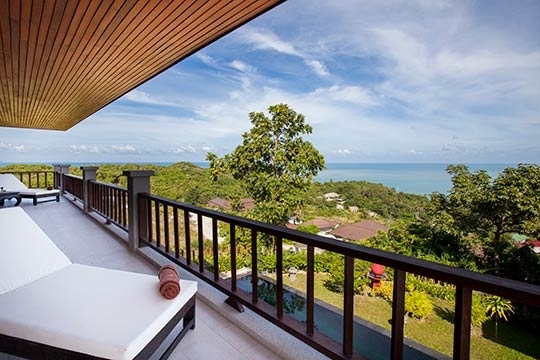 A rocky stretch of coast backed by steep cliffs divides Samui's eastern and northern beaches. Choeng Mon beach sits in a deep bay that cuts into the rocky coastline, its soft sands considered some of the island's finest and the shallow waters ideal for year-round swimming and sunbathing. The beach here is lined with restaurants and boutique hotels. Inland, the small tourist town of Choeng Mon has developed along the main road with tailor's shops, restaurants, bars and supermarkets serving visitors. Chaweng, the island’s most developed tourist area, is around five kilometres south of Choeng Mon, reached via a long hilly stretch of cliffs and bays. Once you get there, the choices for food, entertainment and shopping are vast: the main strip lined with stalls selling copy goods and souvenirs, interspersed with restaurants, bars, boutiques, opticians and pharmacies. The third largest island in Thailand, Koh Samui is just 21km at its widest point and 25km at its longest. The hinterland consists of forested limestone hills and the shoreline is made up of countless coconut palm-fringed beaches and bays. Traditionally a coconut plantation and fisherman's haven, in the last few years the island has grown into a major holiday destination with regular connections to Bangkok and direct flights from Hong Kong and Singapore. Despite rapid development, Samui is small enough to retain its charm and its modest size also makes it a convenient, laid back location even during busy seasons. 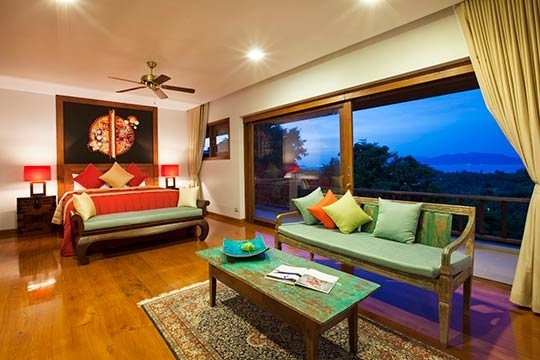 As well as fine beaches, Samui is known for recreation, relaxation and fine food. The blue waters of the Thai Gulf provide a wealth of possibility for water sports, while on land the island is well known for its professional and indulgent spas and health retreats. Fresh seafood is a specialty at most of Samui's restaurants, but you can also enjoy food from almost every corner of the globe thanks to the island's strong international influences. Each beach on Samui has its own particular character and ambience. The east coast beaches of Chaweng and Lamai are busy, commercial areas with everything from beach vendors to fast food chains, while to the north, Bang Rak and Bo Phut have a more relaxed local village atmosphere. Beaches like Lipa Noi and Laem Set on the western and southern shores feel much more remote and untouched. 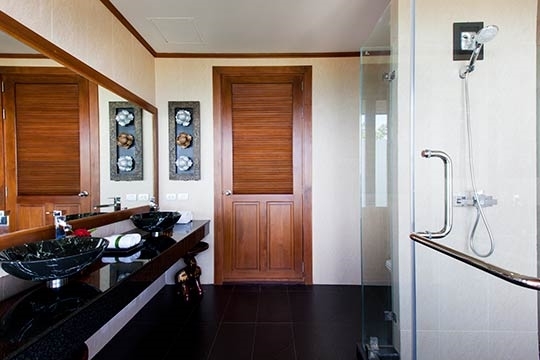 Koh Samui combines comfort and convenience with a sense of real escape and this has made it a popular choice for residential as well as tourist development. The island is an eclectic blend of nature and sophistication, one that draws repeat visitors every year to indulge in its tropical delights. Entering the villa through big wooden doors, your eye is caught by an impressive antique copper bell chandelier with crystal droppers, which sets the scene for the rest of this well-appointed villa. 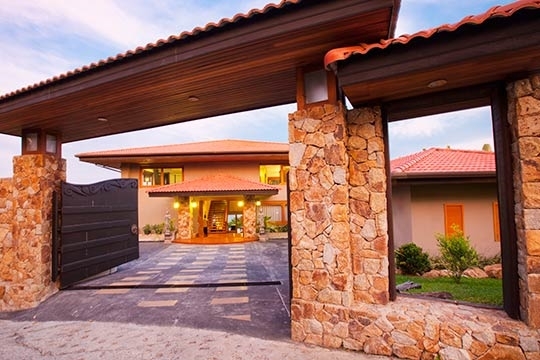 The villa is arranged over two levels, and a polished wooden staircase leads from the entrance hall up to the four bedrooms, and down a few steps to the open plan living areas. 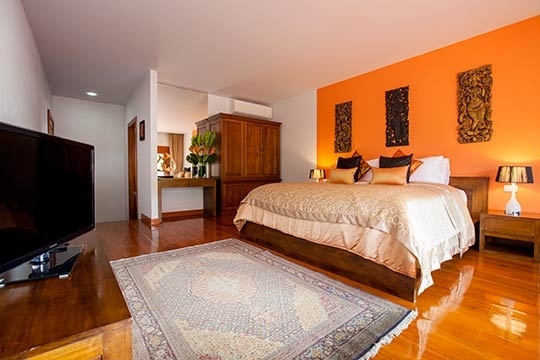 Hilltop View 2’s four ensuite bedrooms all boast king-size beds and each is decorated with a vibrant colour, enhanced by Persian carpets on the glossy wooden floor. 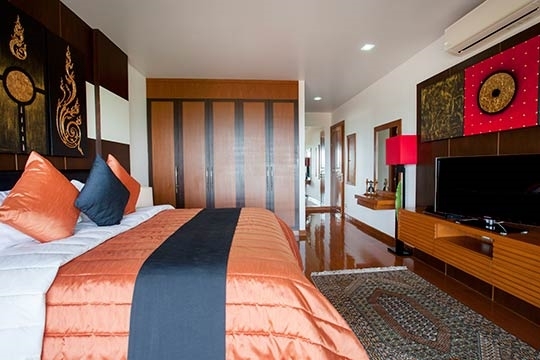 The rooms are equally proportioned, although the master bedroom also offers a small TV lounge. This makes Hilltop View 2 a good fair-share option for friends travelling together. All bedrooms open onto a covered wrap-around balcony, with the master bedroom and bedroom three offering the best sea views. 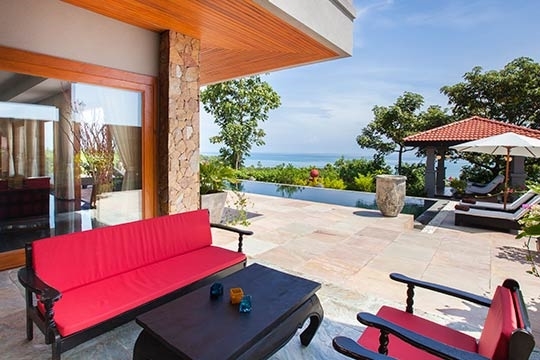 You won’t have to argue over the remote in this villa, as all bedrooms have not only TV/DVD but also their own satellite decoders for individual viewing. 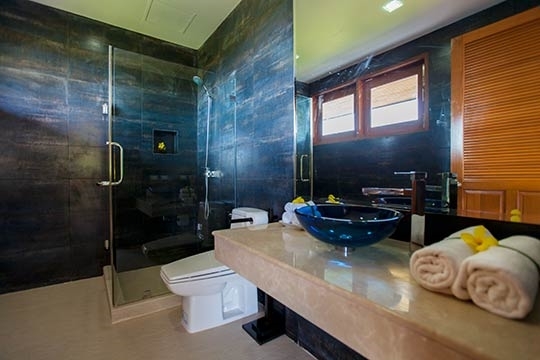 The ensuite bathrooms are more compact than at some villas in this category and none have bathtubs, but the decorative theme of collectables carries through to them too. Downstairs, the living and dining area has an opulent feel with a black marble floor, wall features with gold trim, and cabinets displaying the owners’ impressive collection of antiques and crockery. In an alcove under the stairs, a wide cream couch faces a large flat-screen TV positioned in the middle of a red feature wall. Looking towards the ocean, a carved daybed and a teak coffee table displaying a large wooden candelabra form a perfect reading spot. 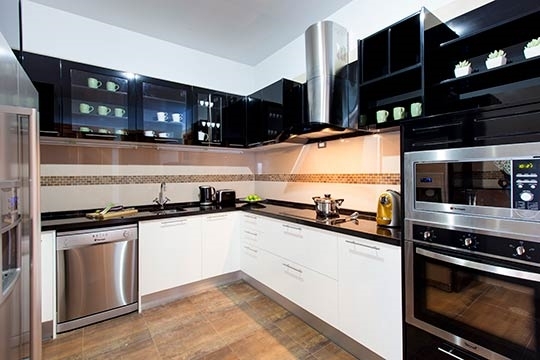 Over on the opposite side of the room lies the eight-seater dining table and compact yet fully equipped kitchen. Sliding doors lead to the outdoor covered bar to the side area as well as the sandstone terrace at the front of the villa, dotted with loungers and sunshades. 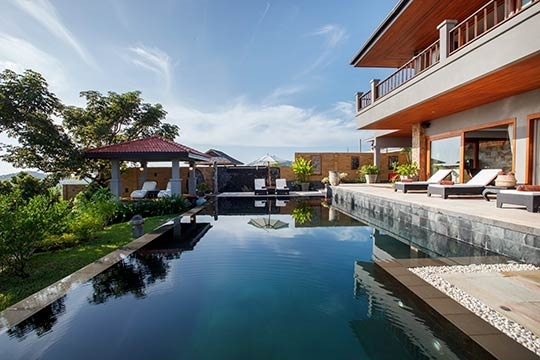 A 64sqm black-slate pool complete with jacuzzi takes centre stage on the terrace, and a sala furnished with two ornate loungers lies to the other side, surrounded by the tropical garden. 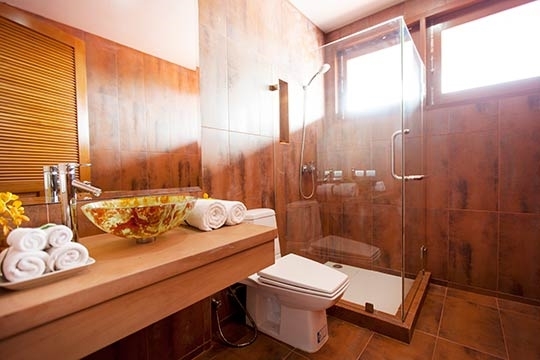 Discounts are sometimes available for this villa if you do not use all the bedrooms. Contact Customer Service for details. 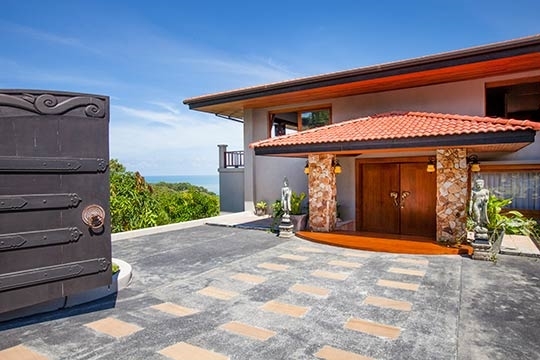 4 bedroom villa located in Choeng Mon, Koh Samui. Ideal for Beach in ten, Body and soul, Bring the relatives, Going for golf, Fair share for groups, Sensible for seniors, Room with a view.